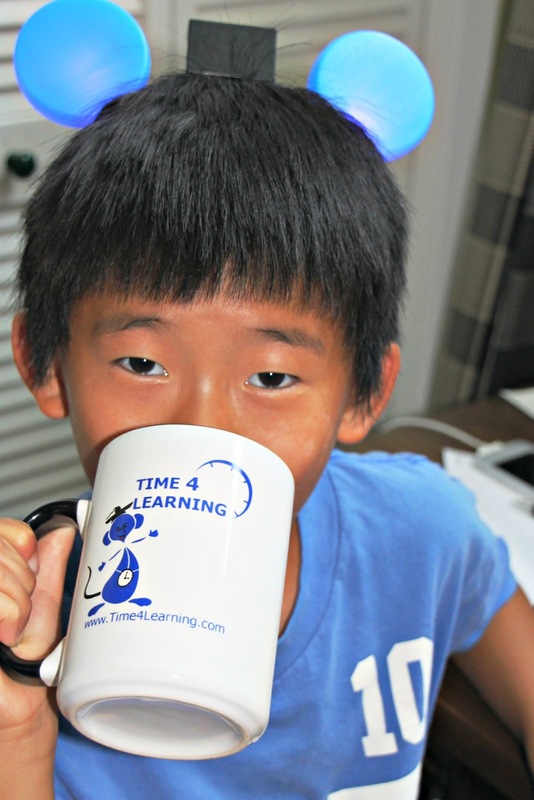 As a member of Time4Learning, I've been asked to review their online education program and share my experiences. While I was compensated, this review was not written or edited by Time4Learning, and my opinion is entirely my own. Write your own curriculum review or learn how to use their curriculum for homeschool, after school study or summer learning. Home from China just a year and a half, we're still playing catch up in the area of academics, especially reading. Believe me, I'm not complaining. While a year and a half ago Wenxin had never been to school (in China or America), didn't speak a word of English, and couldn't tell an "A" from a "Z," now he's virtually fluent in spoken English and reads at a solid first grade level. He's a learning machine. Now that summer's here, we need to keep this academic ball rolling, but any "school" done during summer vacation needs to be a lot of fun! Enter Time4Learning. Time4Learning is an online learning system that we used when Wenxin first came home from China. I needed something he could do independently while I worked with my other homeschooled kids, and when he first came home, I couldn't get Wenxin to do anything independently. At the recommendation of our social worker, we used Time4Learning for a couple of months, and were pleased with the results. 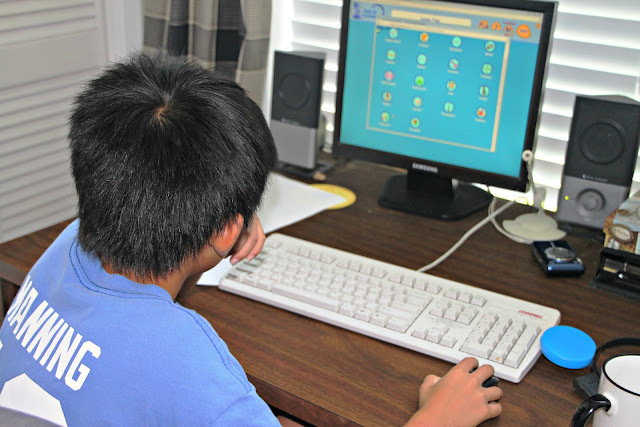 Because Wenxin enjoyed playing on the computer, Time4Learning was a stress free way for him to learn the English alphabet and all the consonant and short vowel sounds. 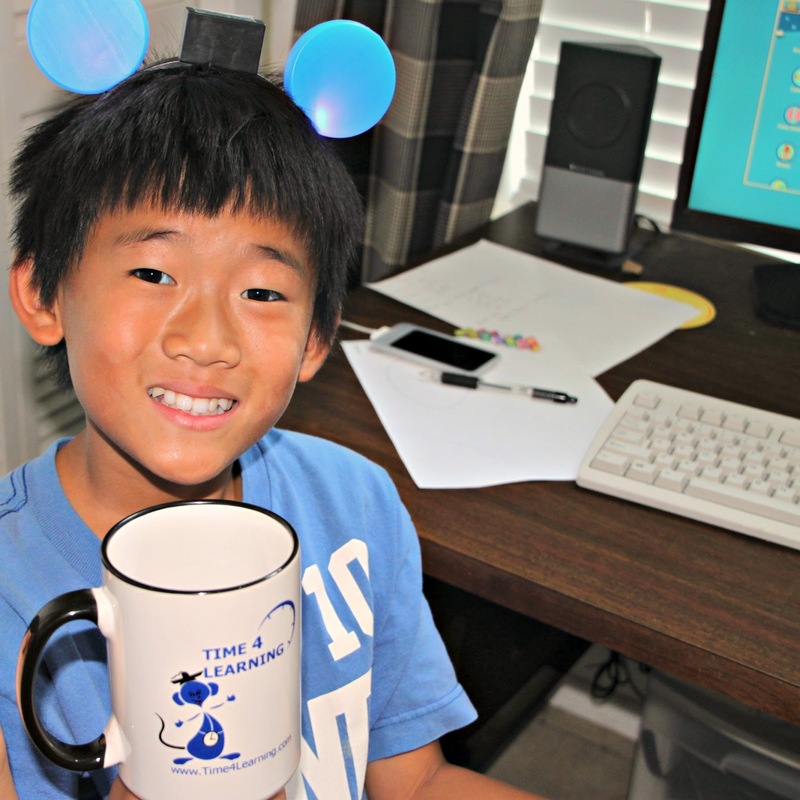 At the homeschool convention last weekend, I decided to renew Wenxin's Time4Learning membership -- just for the summer -- to give him a fun way to keep honing his academic skills. It's solid academically, covering all areas of language arts along with math, science and social studies. You get access to activities for 3 grade levels: the grade level you choose for your child plus one grade above and one grade below. This helps us because while Wenxin was a 2nd grader this year, he did 1st grade language arts and 3rd grade math. There are lots of kids like that. As a parent, you control the amount of time your child has to work on academics before he gets a set amount of time on the site's "playground." You monitor written reports of your child's activities. You see what he attempted and his percentage correct. I print these reports for Wenxin's homeschool portfolio. Their customer service is impressive; I e-mailed them this morning and got a response within a few hours. Last of all, Time4Learning gives you a two week money back guarantee. You can cancel for a full refund any time during your first two weeks. So trying it is risk-free. An observation: To get the most out of Time4Learning, the parent has to take a little time to get familiar with the site. I'd suggest you sit with your child the first 2 or 3 times he uses the program. I'm still figuring out how to best use it with Wenxin this time around. If you have a child who needs lots of practice in one area, say, for example, short vowel words, they may run out of practice activities on Time4Learning before they are ready to move on to long vowel words. This happened to Wenxin when he used the program the first time. That's one of the reasons we cancelled after a couple of months. The other reason was. . .
You have to pay $19.95 a month for it, for as long as you use it. I, for one, generally look for free online resources and am reluctant to sign up for paid subscriptions. However, since Wenxin needs some extra help this summer, I'm open to all options. I checked into a summer reading class for him through a local university, but found it was $330.00 for five 2 hour classes. After choking on that price, Time4Learning seemed like a bargain, so I guess it's a matter of perspective? And there are ways to make Time4Learning more affordable. First of all, they will compensate you financially for writing an honest review on your blog, just like I'm doing now. You can also refer friends, and Time4Learning will send you a $25 Visa gift card for every family that signs up (after their trial period). That translates into free months for you. Speaking of that, if you decide to give Time4Learning a try, just click here to get started, and be sure to mention that Wenxin sent you! So what about you? Are you planning to have your kids do any academic work over the summer? How do you keep it fun? 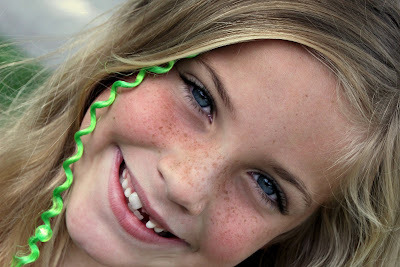 How could the tooth fairy forget a face like this? "He didn't come," said eight year old Katherine, staring glumly into her bowl of cereal. "The tooth fairy. There's no money, and my tooth is still there." "Maybe he's just running late," I offered. "You know, that happens sometimes." Unfortunately, it happens a lot at our house. Our tooth fairy is jet-lagged. He's forgetful. He's even been known to put the money under the wrong child's pillow. This was a particularly bad time for the tooth fairy (and his faithful assistant) to slip up, because this particular tooth had been pulled by the dentist, and Katherine had exhibited exceptional bravery. 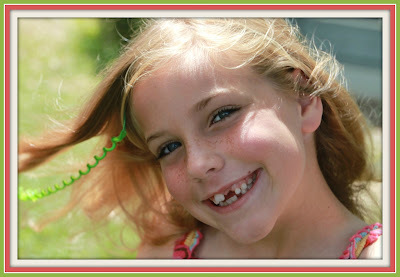 "I already know the tooth fairy is Daddy, and he forgot -- again!" Katherine eyed the note card taped to her bunk bed. Only it wasn't just a note. Two dollar bills dangled from the scotch tape as well. Hmmm. . .interesting. I think the tooth fairy may have felt a little guilty. Katherine's one smart cookie, but she was stumped. How could Daddy have done this? He'd been with her the whole time. She ran to check under her pillow. The tooth was still there. 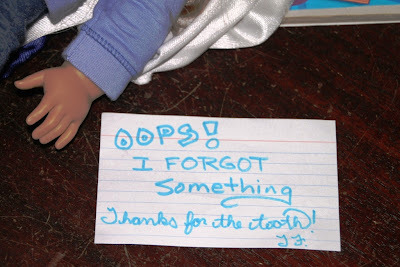 Placing the tooth on her dresser she asked, "OK, if the tooth fairy left that note, why didn't he get my tooth too . . . huh?" Hours later, however, when Katherine passed by her dresser again, the tooth had vanished; only this note remained. Running to my room, Katherine searched high and low, but her tooth was nowhere to be found. Confounding her even more was the fact that her dad was now at work. So who took her tooth? Maybe it was the tooth fairy after all. 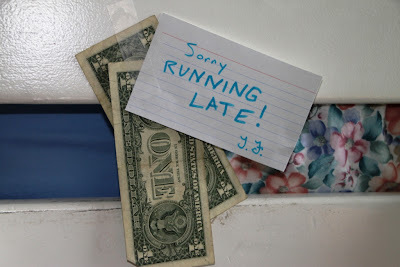 Moral of the story: When the tooth fairy slips up (as most tooth fairies do from time to time), make a fun memory! Older Child Adoption - Love Without Boundaries speaks to the issue of adopting teens who are about to age out of China's international adoption process when they turn 14. Is international adoption ever a good idea for a 13 year old? Here are the reasons that Love Without Boundaries says, "Yes!" What to do When You Can't Find a Mentor - Who's helping you grow in your life? Adoption is the Start of Healing - Is adoption part of the trauma or part of the healing? In closing, I heard this quote at the homeschool convention today: "The mind is not a vessel to be filled, but a fire to be kindled.”― Plutarch. I like that. May my kids have a passion for God and a passion for learning that burns bright in their souls. If I had one piece of advice to give to parents adopting older kids and to the agencies helping them, it would be to get between the child and the guide. Although we were experienced parents, our "gotcha day" was so traumatic for the kids being adopted that we allowed the guide to take over that first day -- and she never looked back. For the 2 weeks we were in Beijing, she would take the girls' hands everywhere we went and walk about 15 paces ahead of us. This one thing affected (and is still affecting 4 years later) the bonding we could have been forming with our daughter. So not only did she lose her birthmother and her foster mother -- who she'd only known to be her "real" mother, she also had to lose the guide when we left for Guangzhou. Thankfully, the guide we had in Guangzhou was an experienced parent herself and had her own daughter to care for, so she did not interfere with our parenting. Even if you have no children and are parenting for the first time, don't let the guide/translator act in your stead. Even if you are afraid of screwing up, just remember that there will be many more opportunities for screwing up in the future and your children will survive. There won't be many more opportunities to take back those initial days of bonding, where you can become the life raft your child clings to. Yesterday, Annie left the above comment under What I'm Learning: Older Child Adoption and Attachment. It was too good to leave hidden way back in the archives of Death by Great Wall! Thanks, Annie. And thanks to all the new readers who've stopped by in the last few days and left comments. Your comments have added value to this blog, making it an even better resource for all of us touched by older child adoption. I love what is happening here. So what about you? What one piece of advice would you give parents adopting an older child? Leave a comment below. Don't be shy if it looks like you're the first one. I moderate all comments, and today I'm away from my computer. As soon as I get home tonight, I'll publish all comments. Today and tomorrow, I'm off to the FPEA (Florida Parent Educators Association) Annual Convention. It's not too far from my home, so I'm a commuter. Still, it's rare that I have a whole day apart from my kids, much less two whole days, so I'm excited. I already have a post ready for tomorrow morning, so I'll see you then! How do you make wise educational choices when the child you're adopting is already a teen and doesn't speak a word of English? Today's Guest Blogger, Sandy, shares her story. I've had several people ask about schooling our children after their adoptions. Ben was 6.5, and John was almost 14 when we adopted them. If you read our entire blog, I stopped blogging when the children were going to begin public school. Well, public school was a big, big mistake. Really. if it is at all possible, do not send your older adopted child to public school. First of all, John had to spend a week testing, as mandated by the state of NY and our Federal government. He didn't understand two words of English, of course, so the testing itself was upsetting, confusing and frustrating. Then, the school decided to place John in 6th grade (age 14--normally 8th grade), and (because of his test results) he was required to take 3 periods of ESL (English as a Second Language) a day. His ESL class was made up of Spanish speaking migrant workers' children, and it was a complete and utter waste of time. I sent in several hundred English/Chinese flashcards that I bought, and I purchased an expensive English language learning program for Chinese speakers that I gave to the school. The teacher basically babysat the kids all day and did not even look at the resources I provided. I'm not exaggerating when I say that the only English words he learned at school, in the 10 weeks he attended, were profanities. His first full English sentence was to tell his brother to "F off." In addition, John latched on to the kids who would readily accept him, and naturally they were the losers, dealers, and delinquents. John was almost 14 years old upon adoption, but like most post-institutionalized children, he was several years behind socially, emotionally and academically. John looked, and acted, like a 10 year old. Also, attending school all day also slowed down John's English acquisition. Sitting in a classroom most of the day with kids who did not speak English (and had no intention of learning English) only made John resist us more. In addition, it took away from the time we had with him to establish bonding. In June, after 10 weeks of public schooling, we called a meeting with the administration, guidance office, ESL teacher etc. I have never seen my husband go absolutely bonkers (he is an attorney), but I thought his head was going to explode when the vice-principal bluntly announced that John would never graduate high school. He'd be 21( and age out) first because John was going to miss 3 core subject classes a day, in order to attend his federally mandated ESL classes. John would not get enough credits to graduate, according to the administrator, in four years of schooling because of the ESL classes. I had to almost physically restrain my husband when the principal said that, by the way, HE was going to make the educational decisions for John, since John was at school 6 hours a day and ultimately the principal is responsible for the child's education and the principal knows what is best. Umm. No. Sorry. You just happen to work here right now. Our son's education is way more important to us, than it is to you, jerk. You might have him for a few years, but he is our son forever!! And we know him better, understand his needs, and you know virtually NOTHING about children adopted from China, or their needs! I am certified in New York to teach Reading K-12 and English 5-12, so I could at least speak the school's lingo, but the administration was practically trying to bully us! As I said, I'd never seen my husband go ballistic, but he went nuts when the school told us that they were going to make all the decisions because they knew what was best. And that John would never be successful because it was just too late for him. The next day I started a search for a private school. Our oldest son (now age 16) has been attending an all-boys college prep school, McQuaid Jesuit, since 7th grade, and at that point I was homeschooling our son who was 10. McQuaid, however, has rigorous admission requirements and costs 2 arms and a leg. And I just didn't feel that I could homeschool a defiant, angry teenager, who didn't know English. Then, I found Lima Christian School that offers a K-12 program. The school also works with several agencies in Asia (China and Korea) that send students to Lima Christian to master English so that they can get accepted into American Universities. They understand how to work with Asian students, and the other ESL students are highly motivated to succeed. The school placed John in 8th grade, at our request (only one grade below age appropriate at age 14.5), and arranged his schedule so that he had the ESL teacher all to himself for one period a day. He also had a study hall where he was peer-tutored every day. The teachers held him to the same standards as the other students, but did provide extended test taking time when necessary. We received weekly progress reports, and we spent hours with him at night doing homework. The school jumped through hoops to make certain we were happy, and they checked with me before adjusting his schedule or giving him modified assignments. Now, John is in 9th grade, and he works independently most of the time at the 9th grade level. He maintains a B/A- average. At my request, we continued the one period a day with the ESL teacher. She makes certain that he is "getting" everything. Next year he will join the regular English class and will no longer be considered an ESL student. Ben (age 8.5 now, 6.5 upon adoption) never received ESL classes. He's completely fluent in English, and almost at grade level in reading and writing. Unfortunately, he has forgotten his Chinese. At the private school we are the consumer...they will adjust the curriculum to meet the child's needs because if they don't, we can find another school! Our son Connor, who was homeschooled, would be in 7th grade in public school because of his age. He is in 8th grade at LCS, because of his abilities, and in 10th grade math and science. On top of that, he has a 95 average too. With a graduating class of 16, the school can be flexible and meet all our children's needs! Hooray! sweet boys, adopted last month from China. Thanks, Sandy, for a great post. I'm so happy that your perseverance paid off, and you found a great school fit for all your kids. 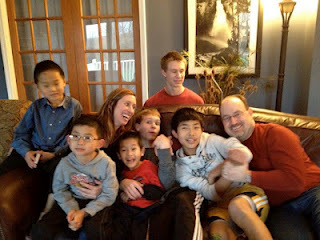 Sandy has two adoption blogs, Our Adoption Journey, which tells the story of John's adoption and Petersadoption which chronicles their 2012 adoption of two more boys from China. Sandy first shared today's story back in December 2011. Now wrapping up another school year, John has made even more progress. "After the adoption, if we could have found another more suitable family to take him, if we could have done it without hurting him further -- we would have considered that." "Be prepared for learning issues. It's easy to take the skill of logical thinking for granted." "This is going to be hard. It will be different from what you expect. Your newly adopted son may bite you." Older child adoption is hard. The above quotes come from three actual conversations I had with three different adoptive moms the summer before we traveled to China to adopt Wenxin. It was sobering. I expected each one to say it was hard, but some of the things they shared were not just hard, they were harsh. These moms loved their adopted children. They cared about waiting kids. They were pro-adoption. However, having lived the hard parts of older child adoption, they refused to lie. I thought the lady who mentioned biting was a nut case -- until I was actually bitten. Thankfully, that only happened once. Older child adoption is hard. It can be difficult to explain to someone who hasn't lived it. That's why I tell stories. 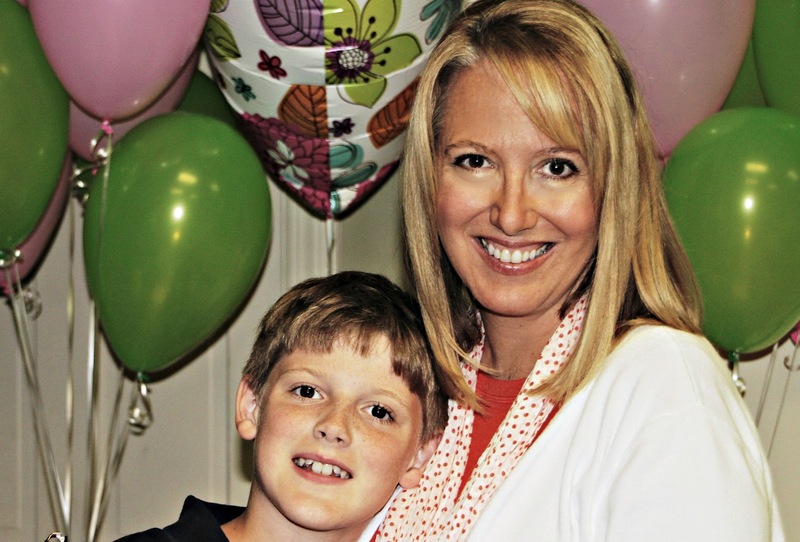 Stories give a glimpse of what older child adoption looks like in real life. And honestly, it's aways a mixed bag -- so many sweet times -- and so many exhausting struggles. When Wenxin had been home about a week, I wrote a post called The Ups and Down and All Arounds. It's a great snapshot of the early days of our adoption, so I'm reposting it here today. Wenxin let me teach him how to write his name in English and then. . . he drew our family. First, there's Mike, and then me in the green. I love the details - Mike and I holding hands with a heart between us. Next, holding on to my leg, is Wenxin. Then Nathan and Katherine. Finally, Julia - squeezed in between Mike and me. We didn't start off so well. And then he began to grab for the book. I said, "No," and continued to read and hold the book up for both kids to see. More grabbing. . . and then whining. When I insisted on holding the book, Wenxin turned his back to me and sat facing the other way. Then he walked off. Poor Katherine was left having to listen to Hop on Pop. Wenxin walked past us a time or two and made vomiting noises in our direction. Then he ran by and slapped Katherine on the top of the head. Mike and I intervened and gave Katherine lots of loving and had Wenxin apologize to her. It's the first thing I've found that he enjoys doing by himself. We bought a cool toy in Beijing. It's a pen that reads special books in both English and Mandarin. Mike got the vocabulary book and touched the word that said, "sick." Wenxin listened to the word for sick in Mandarin and agreed that he felt sick. Then Mike said, "Mama will take you to the _____," and he touched the word for "doctor." We'd get one shoe on, and the other shoe would go flying across the room. He was sobbing and fighting and clawing. It became clear that there was no way I'd be able to drive him safely to the doctor. The next morning, Mike and I packed a backpack full of toys and snacks and drinks, and together, we took Wenxin to see the doctor. We decided it was a "two parent" job. We decided not to announce exactly where we were going. And this time, he did great. We're learning. Click below to like Death by Great Wall on Facebook. Thanks! In June 2010, I wrote this. There are still several million children who've lost both parents and have no family member to care for them. There is still an "orphan crisis" for these kids. So does it really matter that instead of 163 million, as is so often quoted, it's only a few million? Is it really a big deal if we get the number way wrong? Leave a comment and let me know what you think. I had every reason to be nervous as I pulled into school yesterday for the 6th grade "Mother's Day Honoring Ceremony." I kept remembering another time I was honored by Nathan's class for Mother's Day. 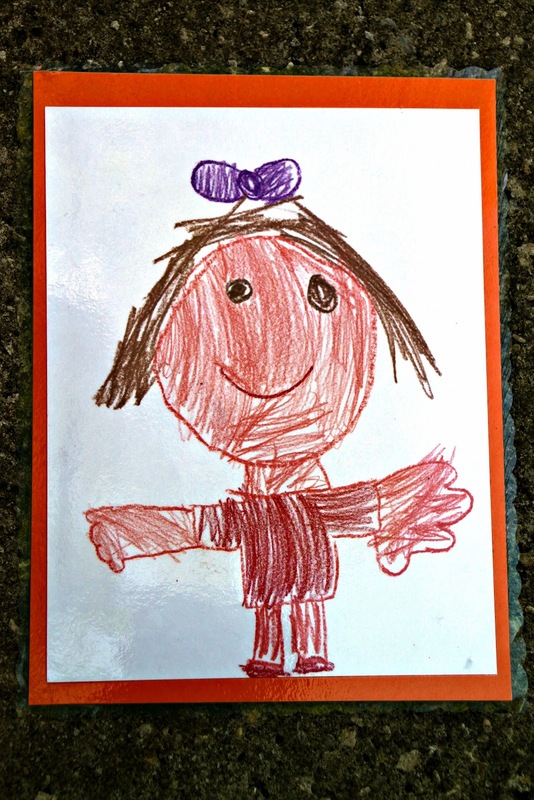 It was second grade, and each child drew a portrait of his or her mom. I should probably just stop right now. 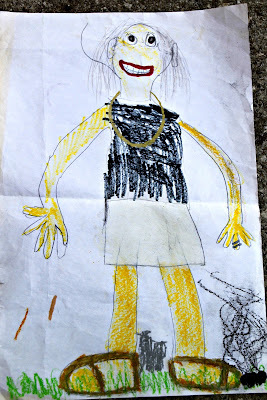 I should just let you gaze on my son's artistic representation of his mom. A maniacal, burning coal stomping, cave woman. I knew it was me the minute I entered the room. The black shirt, the gold necklace, the wedding rings, even the shoes. I could see how, in Nathan's mind, it looked just like me. The clincher was the smoldering coal at my feet. Back in second grade, Nathan loved stuff like that. Nudging my friend, I said, "That one's me." "No, it couldn't be," she whispered. "Oh, it's me for sure." So approaching Nathan's room yesterday, I had reason for concern. I'd already gathered that this year, the children would read poems each child had written honoring his or her mom. I kept telling myself, "The teacher helped them write. The teacher is my friend. She would have helped them edit out anything embarrassing or inappropriate." I had a sick feeling Nathan might write something like, "My mom really gets irritated when my Dad. . ." You just never know. Then, the teacher made a speech. "The poems your children are about to read are totally their own work. I didn't even read them. Just like you, I will be hearing them for the first time today." In the end, Nathan's poem was very sweet, very appropriate and not embarrassing at all. Sigh of relief. Bullet dodged. I felt honored. Here we are after the ceremony. 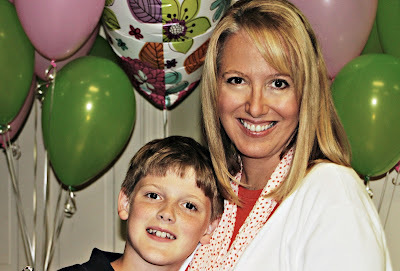 Back to that Mother's Day, four years ago -- the saving grace of the day was that after Nathan's party was over, I went down the hall to Julia's party. Five-year-old Julia had drawn a picture of me as well. In Noah's Defense - when Noah, an older child adopted from Ethiopia, comes home, he is dropped into "a world so new, so fluorescent, so busy he would hardly have time to breath." Funny and insightful. The Silent Adoptee - an adult adoptee struggles against a closed adoption system to find her birth and medical history when she's diagnosed with a potentially fatal illness. It's Safe to Get Rid of Old Trophies - wisdom for clearing the clutter in your home. A Critique of Saddleback Church's Recent Orphan Summit - As Christians work together to care for the world's orphans, it's important that we fact check: both the facts about the world's orphan crisis and the facts about what the Bible says in regards to it. 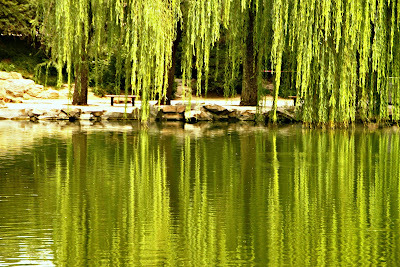 Ripples - ripples from the life of one young boy. You intended to harm me, but God intended it for good. Don't Carpe Diem - if you are a tired mom with young kids, you'll find this funny. While I was still recovering from childbirth, I attended a funeral with a tiny casket. When all was said and done, I was left with milk engorged breasts, but no baby to nurse. In the days that followed, I often sat crying on the sofa while eighteen-month-old Nathan played in the floor, Teletubbies babbling pointlessly in the background. “People are irreplaceable," my pastor told me gently. It was the best thing he could have ever said. I went on to have other babies – beautiful sweet babies. Julia was born 15 months later. Katherine came 18 months after that. Our house became crowded with kids and toys and laughter as our schedule overflowed with play dates, park days, and trips to the pediatrician. Years later, we were blessed again as seven-year-old Wenxin became our son through adoption. Julia, Katherine, and Wenxin are amazing, and yet not one of them could actually replace Sarah, because the people we love are irreplaceable. I don’t share this story very often anymore. It’s too sad, and I don’t want to give people the impression that we have a sad life. The truth is we have a lot of fun, and we’re hardly ever sad. Usually, we’re laughing too hard to be sad. Nevertheless, this is part of my story. God used Sarah's life and death to shape me into the person I am today. After Sarah died, Mike and I attended a group for couples who’d lost infants to miscarriage, stillbirth or early infant death. The counselor there defined grief as “the realization of what you’ve lost.” That was new for me. I’d always equated grief with funerals and tears, the outward act of mourning, but this was a little different. What I’ve found to be true is that grieving someone this way is a lifelong process. It doesn’t mean you are sad every moment of every day for the rest of your life. Honestly, I’m rarely sad about Sarah anymore. But every now and then, grief sneaks up on me, and I'm faced again with the realization of what I’ve lost. When Nathan was entering second grade, I was driving home one day from a meeting at school with his new teacher. Some melancholy song came on the radio and out of the blue, it hit me. “Sarah should be entering kindergarten this year. She should be starting school.” Where in the world did that come from? I hadn’t even been thinking about Sarah. But, nonetheless, there it was. I began to sob as I realized the loss. “I should have two kids in school this year; instead I only have one." 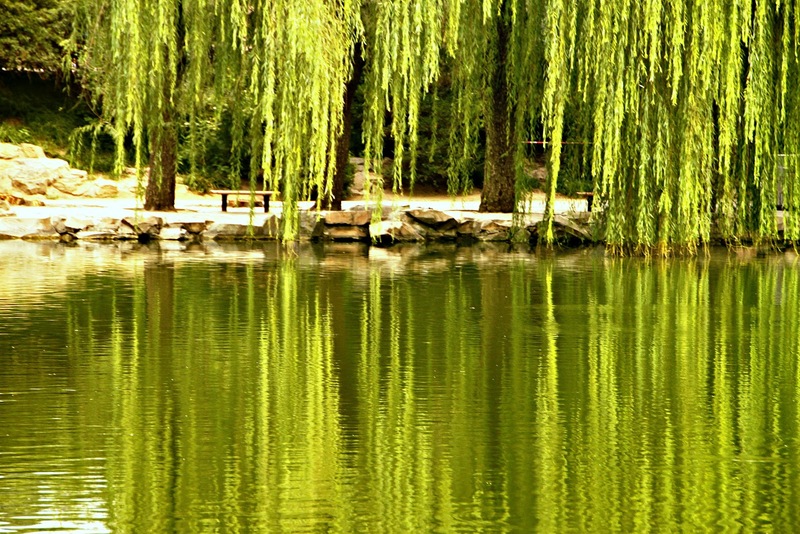 My personal experience of grief and loss colors the way I think about Wenxin’s loss of two important people in his life: his two mothers who came before me. I am Wenxin’s mom today, but I am not his first mom. He grew for nine months in his Chinese mother’s womb and probably spent the first month of his life with her. We may never know for sure why she couldn’t keep him. Was he perhaps her second or third child in a country that allows parents only one or two? When he entered the orphanage system, he was sent to live with a foster mom. Now I know it was her job to care for him, but she’s still the only mom he remembers. She was a real mom to him. Since he lived with her for several years, she’s the one he cried for when he was taken back to the orphanage to await international adoption. Because she was old, more like a grandma, he wonders if she’s dead now. He still remembers her visiting him in the orphanage and bringing him a snack. Just like Julia and Katherine could never serve as replacements for Sarah, I am not a replacement for Wenxin’s mothers who came before me. I don't feel threatened by Wenxin’s other moms. It doesn't make me feel diminished to admit I'm his third mom. I'm his mom today, and I fully intend to be his last mom. Wenxin is well-adjusted and happy in our family. Maybe he will never look back, but I won't be surprised if someday in the future, grief sneaks up and hits him with the realization of what he lost. He may grieve the loss of one or both of his other mothers. It won’t mean that I’m a bad mom or that he doesn’t love me. 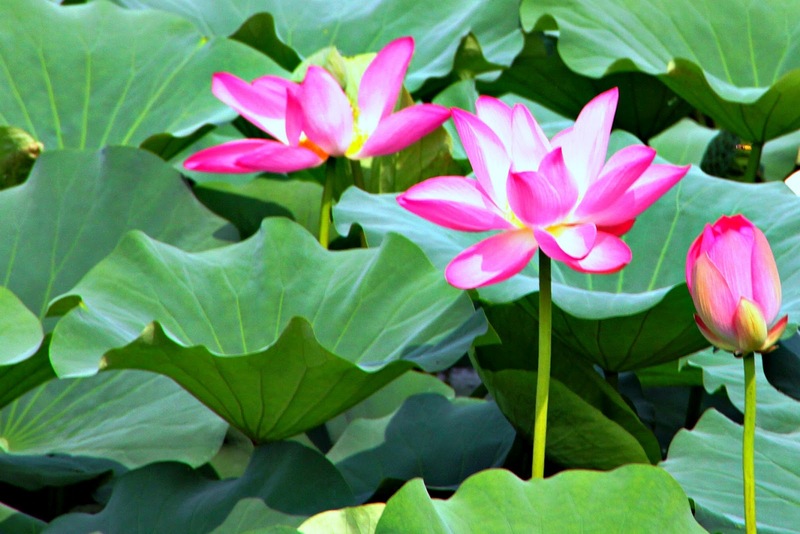 It will just be grief – a normal and healthy response to loss. I refuse to add baggage to his grief by making him feel guilty for loving or missing them. If that day comes, I’ll say to him what my pastor said to me, “People are irreplaceable. That's why this is hard." I'll support him if he wants to search for his birth family or reconnect with his foster mom. Any relationship he might re-establish with them does not negate his relationship with me. They can't replace me, just like I can't replace them. *Sarah died from complications from Trisomy 18 - a chromosomal disorder that is usually fatal. Had she lived, she would celebrate her 11th birthday in July. Thank you so much for dropping by Death by Great Wall and taking the time to read my story. I hope you'll come back. Over on my sidebar there are three easy ways you can connect with me. Join this site through Google Friend Connect. Just click "join this site" and follow the instructions. Or "like" Death by Great Wall on Facebook. Or sign up to get new posts delivered by email. Whatever way you choose, I look forward to connecting with you! Shared at We Are Grafted In. I'm posting these links on Friday instead of Sunday this week. There's a lot of good stuff here, and I want to give you time to check out as many as you'd like. You may notice that I included posts by both a birthmother and an adult adoptee. That's important. As adoptive parents, we need to listen to and honor their voices. What a Nursing Bra Taught Me About Friendship - aren't you curious about this one? Friendship is Hard (and How to Make it Easier) - a follow-up to the "nursing bra" post. "Positive" Adoption Language? - written by a birthmother. I Choose Being Here - is it weird for a mom to prefer a night home with her kids to a Girls Night Out? Why My (Amended) Birth Certificate is a Lie - written by an adult adoptee. The Other Side of Obedience (and why I hate sequels.) - I may have saved the best for last. This is a powerfully written story of a couple who takes in six foster siblings. No kids were harmed in the writing of this post! "Remember when we were little and Mom used to reward us by giving us rocks?" I know it's coming. One day, my kids will ask that question at a holiday dinner. Maybe they'll even bring me bags of rocks as gifts when I'm an old lady. Probably they'll laugh all the way home. But today, no one is laughing or even complaining. Rocks are big stuff at our house. Late Saturday afternoon, after a full day of soccer games, we stood on an empty field in Ormond Beach. Most of the players had already left for the long drive home. As we chatted with one of Julia's coaches, he said some nice things about her. Julia has some pretty amazing soccer skills, but more than anything, when she steps on the field, she is a warrior who never gives up. She leaves everything she has on the field, every game. It's pretty impressive for a nine year old. As her coach was talking, Julia tugged on my arm and whispered, "Does this mean I get a rock?" I hope the coach didn't hear. This is why rocks work for us. All parents know you should praise your kids more than you scold them. Easier said than done. For homeschool parents it's even harder for the simple reason that we are always with our kids. We play dual roles as teachers and parents. It's easy to become full-time correctors of bad behavior. 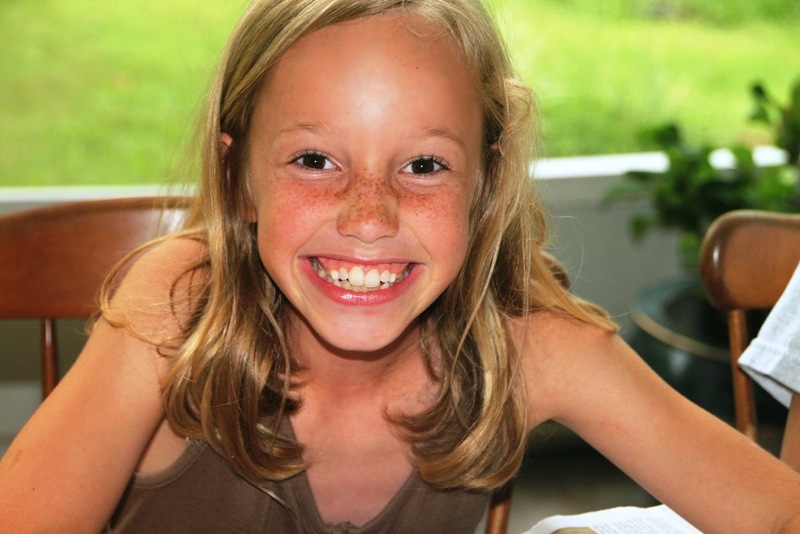 A couple of years ago, my friend, Tara, told me about a system she'd implemented in her homeschool. This idea was totally,100% stolen from Tara. I'm not sure where Tara got it, but I am sure it works. The system involves two types of rewards: marbles and rocks. We are working together as a family to fill the huge hurricane jar (pictured above) with marbles and rocks. Each child starts his homeschool day with an empty marble cup sitting on the kitchen counter. 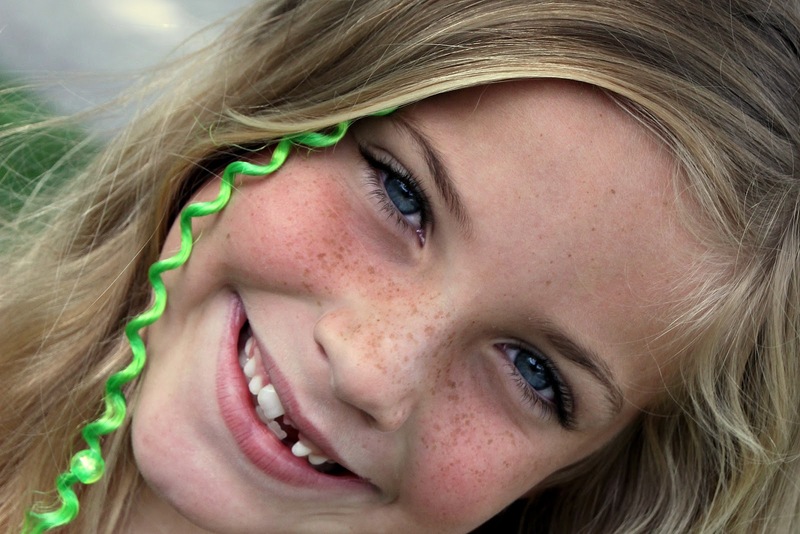 Throughout the day, as I catch a child doing something right (listening, working quietly, encouraging a sibling,) I walk over and drop a few marbles in that child's cup. This is an especially effective way to stop bad behavior. If one child is complaining while two others are working quietly, I simply walk over and drop marbles into the cups of the quiet children. Usually, the complainer gets the message and quickly adjusts his behavior. At the end of the day, each child counts his or her marbles, and then we pour them all into the hurricane jar. There is no reward for getting the most marbles, but they still like to count. When the jar is full, we'll get to celebrate with a family outing -- something that's not too expensive like mini-golf or go-karts. One thing I love about this is that it's not a competition. Everyone should be happy anytime someone gets marbles. We are working together as a family, and every marble puts us closer to our goal. Each person's good behavior benefits the whole family, which is a truth that closely parallels real life. So where do the rocks come in? Well, rocks are special. Whenever we are out in public and another adult compliments one of our kids, that child gets a rock. It has to be a non-family member who catches our child doing something right. When we get home, Mike and I make a big deal out of it. We announce to the whole family what Mrs. So and So said about our child. We let them know how proud we are of them. And then. . . drum roll please. . . we let them go outside and choose a rock. They choose the biggest rock they can find. 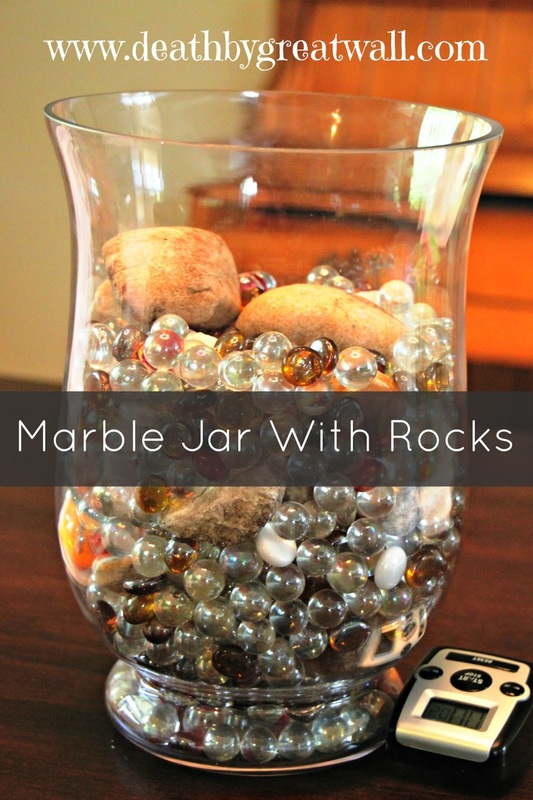 Rocks are gold because they help fill that giant hurricane jar much quicker. And everyone loves to be caught doing something right. Katherine recently noted that she is at a disadvantage when it comes to gathering rocks. Her teacher is her mom, and her soccer coach is her dad which significantly reduces her chances of getting praise from a non-family member. So if you know Katherine in real life, and notice something nice about her, please speak up. You'll make her day. She'll get a rock. And in our family, rocks are gold. Hey, have you "liked" Death by Great Wall on Facebook yet? Visit Death by Great Wall's facebook page, by clicking here. Sharing at We Are That Family.